The Acura ILX, the Honda Civic with a proboscis prosthetic first shown as a "concept" last month at the Detroit Auto Show, was whipped out here at the Chicago Auto Show today in its full production trim. But, while the ILX might be born off the same Civic platform, and with at least one of the same powertrain options, and be built by the same Indiana workers, the exterior shares not a single component with its lowly brother-from-another-mother. In fact, it doesn't even look quite as unfortunate as some had expected. And that nose. Oh, that nose. It's, umm, something! There are three trim levels and engines available. 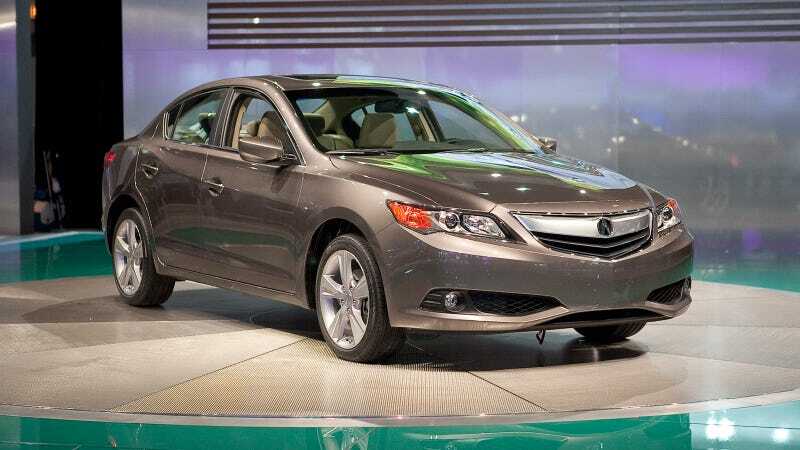 The base ILX gets power from a 150-horsepower, 2.0-liter inline-four mated to a five-speed automatic transmission. The ILX 2.4 — you know, for "enthusiasts" — uses a 201-hp, 2.4-liter four-banger mated to a six-speed manual transmission. There's also an ILX hybrid — it looks the exact same as the non-hybrid ILX, but under the hood it'll use something a bit different. Well, not really. Actually, it's a 111-hp, 1.5-liter four-cylinder engine with a continuously variable automatic transmission plus a mild-hybrid plus regenerative braking and auto start/stop system — the same powertrain/gearbox combo found in the Honda Civic hybrid. But, thanks to some added heft, the ILX is expected to get a lower EPA rating — 35/38 mpg city/highway. Acura is looking to attract first-time luxury buyers to the brand — which is why they're adding in all the same toys (like ELS surround sound and a 60 GB hard drive) as the rest of the lineup — although it's hard to believe a luxury brand could possibly be selling a car that's priced "well below $30,000." But what do you think of the new baby to the Acura family?